Afternoon - To see Cull regarding Patent Safety pin - 7611 - told him how matters stood and said I wished him to superintend matters. Lent him "Johnsons Epitome of Patent Laws(?)". Evening - Out on Beer Business and fixing up and forwarding Cash Sheet. Drove with Frank Tipper and Matey to Blythe marsh (Bloor out) then to Longton to see Lloyd, auctioneer, then to see Kent, solicitor, regarding Byatt, then to see Colliery then, finding no one there, to Bloor's office Hanley (out), back to Ford Hays and put Matey in possession then back to Blyth Marsh (Bloor at Forsbrook) then to Forsbrook found Bloor and served him as Sheriffs officer with notice of rent due, 60 pounds. 5.30pm. Then home. Tired. Been very wet day. Morning - To Whiston with Tom Plant's trap, Matey and son distraining on Charles Kent, Horse Shoe Inn, Whiston and also on his son Joseph Kent, Tinkers Lane. Webb made a model shewing application of my invention to curtain hooks. Packing up models of safety pin and forwarding same to inventions office, see copy letter. I took the models this afternoon and shewed them to Wood, Bank manager, W. Malkin (Rock Cliff) and Southall near Talbot Inn, Mine Manager for Almond. They all seemed pleased with it. Mr Buttress here, taking instructions regarding distraints at Whiston for tomorrow. Evening at 7? Valueing fixtures etc at the White Horse Inn, Cheadle Mill. Brunt to Burton. Morning - Office, squaring up Bull's Head Cottage rents and forwarding cheque to Fowlers(?) - doing up books generally. Afternoon - Webb has made 2 models of my invention relating to safety pin No. Patent 7611 and he is now engaged on 2 more which he promises to have ready for me this evening. I took 2 of Siegel's pills last night and now today I took a dose of Siegel's syrup (about 15 drops after each meal). I think it is only indigestion and at times I feel rather giddy and seem to have palpitation of the heart. A very unusual thing with me. I have never seemed to feel exactly right since I went to Buxton. Morning at Walton Villa with mother, looking over deeds in safe and making a list of same. It is extremely wet weather, raining every day - just like or worse than the New Zealand winter. I have not felt very well during the past few days, my stomach seems to be quite out of order so I must try and get straight again. Walton Villa for tea with Bert. Morning - In town, paying various accounts for mother. Afternoon - Canvassing Common ? for Beer orders and at Huntley Hall etc. Writing out Valuation late W.A. Office. Doing up Books etc. To Bells brewery at 9, saw Mr Roe and had a long interview. Mr Summers charges all unfounded. Summer is not one of Firm, only traveller on Salary. Had lunch at Hotel with Mr Roe at his invitation. Went thro ledger with Mr Tomlinson and looked up all accounts. Left Burthon by 2 o'clock train to Leigh and calling on all customers on way home, very tired. By midday train Froghall to Burton - to Bells Brewery. Mr Roe(?) the managing partner away - saw Mr Tomlinson, the head clerk and going through accounts with him. Stayed at Burton all night - Temperance Boarding House. Samuel Hulme, Manufacturing Chemist, Manchester. Traveller for Dewhurst, Cotton Manufacturer, Skipton, who gave me several of their reels of cotton for Singers Oscillating Shuttle Machine. Afternoon - Distraining upon cottage in Lid Lane occupied by Joseph Salt. Landlord - Luke Swetnam, Kingsley. Mrs Swetnam had dinner and tea with us and enjoyed herself very much. She is Mrs Blurton's sister and is very deaf and uses an ear trumpet. She talks of going to New Zealand with her son. She is well off. Afternoon and evening - To Walton Villa, making valuation for probate of dad's furniture. Office - making a copy of dad's will. He suggested that they should do the pubs and I the private houses - that would be no good. I believe he wants to get dad's business into his own hands. I am going over on Thursday to meet them at Burton - the see the Boss. They are acting very awkwardly. He said I do not spend at pubs - that's a lie. George Yates junior (John's nephew) would leave home today for his situation at Upton Chemist on Severn. Morning - Office. Preparing Bells cash sheet and forwarding cheque 73 pounds 18 shillings and 4 pence and writing them etc. Afternoon - At Walton Villa with Ralph and William (brothers) looking thro dad's safe papers, deeds etc along with mother. Walton Villa for Dinner & Tea. To Kingsley collecting rents for mother. Evening - To C. Westons, painter, received his rent half years due midsummer and settled up generally with him. To Walton Villa, forwarded over to mother all cash received on her account and she gave me 2 shillings and 6 pence. Home. In Market. Jim Goodwin here pot selling. Gave him 2 New Zealand papers. Met Shallcrop at Liberal Club, he is about to take out a license and he and I are going to work together a bit in his district of Leek etc. He is not strong enough for outdoor work and will sell at property sales only so I have undertook to sell for him at furniture and stock sales - sharing all profits between us. Half a loaf is better than none. At 5pm, I sold the park mowing grass. Realised 41 pounds 1 shilling in 3 lots. 8pm. Interviewed Mr William Malkin, Rock Cliff, when he arranged to guarantee me an overdraft of 30 pounds for 6 months and to continue same after that time if required. This is more than Billy Bowers would do for me. I shall not forget that. Morning - To Poultney's, Alton Castle Inn, when they squared off all moneys owing to Bells for Queens Arms Ale etc. Afternoon - Walked to Green Man, ... Dale, Freehay, Raddlestich and home via Mobberley on Beer Business. Took lot private orders. To Leek with Bert for her lesson on dresscutting from Mrs Johnson. Home in evening via Froghall. Saw Jim Goodwin in Leek market, pot selling. His first day at it. Also met John Hodgekiss. Afternoon - To Poultney's, Queens Arms. I found them busy moving into the Alton Castle Inn. Miss Robinson comes on the Queens Arms tomorrow. 1) The Queens Arms is in Queen Street. The Alton Castle is on the corner between Queen Street and Tape Street. Morning - Helping Clara and Walter and Lizzie to pack up. They all left Cheadle by the 10.45 coach to catch 1.7? express Stoke to Euston. Out on Beer Business rest of morning. Afternoon - Office, writing out accounts on new bill Heads. David Shenton has just done me 200 forms. At John Yates for tea with Bert and Clara and Lizzie Perkins. 1) John Yates was married to John's sister Sarah Ann. In the 1881 census he was aged 42 and a builder employing 11 men, living in Bank Street, Cheadle. 2) Alberta's sister Clara had arrived on 2nd June so by this time she had already been staying for over a month. Afternoon - To Newclose Fields on Beer Business - Mrs Whitehurst tells me her husband has written Bells regarding error in account. Mr Martin opposite says he and Massey and ? all get their ale off Charringtons agent who drives a grocery cart from Fenton. Says it is the best ale he can get. 1) Newclose Fields Farm is in the parish of Dilhorne. Evening - Writing letters etc in office. At 12 o'clock I started with Dean(?) in Tipper's trap and drove thro Ipstones and Bottom House to the farm for sale as occupied by Mr Harrison. Between Bottom House and the farm, we were caught in a very sharp thunderstorm - awfully close thunder. After looking over the farm, drove back to Ipstones and put up at the Red Lion and sale at 4 o'clock, Masefield solicitor. Realised 885 pounds. 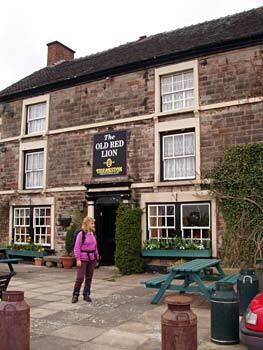 1) The Red Lion at Ipstones. To Tean in afternoon on Brewery Business - and Gorsty Hill. Afternoon to Longton. Called on J.P. Bettany(?) at Meir and looked over Mrs W. Alcock's property, which I found in bad repair. Thence to look at the Railway Hotel, Foley, on sale - so as to send word to Bells. Had tea at Mrs Nelson's, Gate Street and supper at Jim Goodwin's - 9pm train from Longton and walked back from Blyth Bridge with Loton(?) Hordern and his wife. Wet night. Home and out on Beer Business. 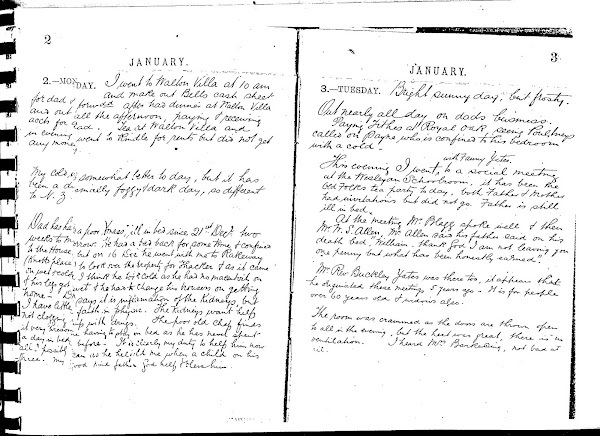 1) Although John was a Methodist, this is the only time in the diary that I have read about him going to church on a Sunday. It must have been because his father had just passed away.